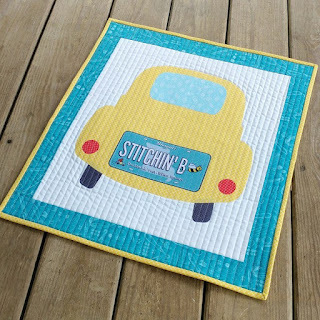 Slice of Pi Quilts: TGIFF - A Linky Party! Welcome to TGIFF (Thank Goodness It's Finished Friday)!! I have two finishes that I'm sharing this week - both for my local quilt shop's Row by Row! I shared the finishes on Monday in separate posts, but finishes are always worth celebrating! First is a mini quilt I made using the shop's fabric license plate. It was a quick make, and a perfect fit for this year's Row by Row theme, "On the Go!" Read more about the quilt on this post. My second finish is a baby quilt using the shop's Row pattern. This is my second year writing the pattern for their Row, and I wanted to show the Row used in a different way. This one truly got the "Thank Goodness It's Finished" stamp when it was done!! The cross-hatch quilting in the Row section took much longer than I anticipated! 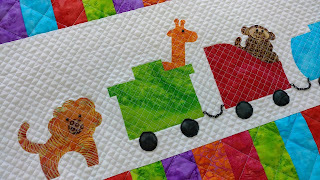 I don't normally add embellishments to my quilts either, so adding the wheels, eyes, and chain took time I wasn't expecting. It needs a "This took forever!" tag! You can read more about the quilt on this post. So what have you finished lately? Link up a blog post (or even an Instagram post!) so we can celebrate with you! Remember, it's not a party if you don't mingle with your friends! Be sure to visit and comment on a few of the other posts too! Oh, and that train is just too adorable! And why do the details always take longer than we think they will? Neat projects! Well done. Things usually take me longer than I anticipate :) Thanks for hosting! These are both cute little projects and congratulations for hosting TGIFF for the first time. What sweet little projects those are! The car is way too cute! Thank you for hosting TGIFF this week! They are both so adorable! and the hosting worked!!! 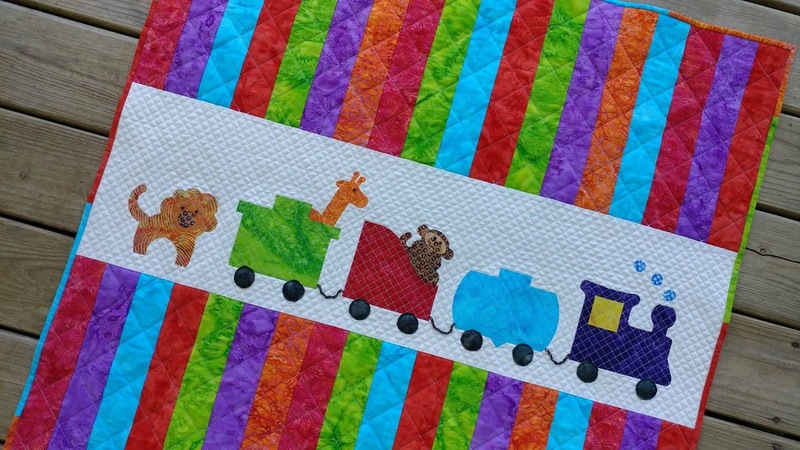 I love the idea of using the row pattern to create a feature on a baby quilt or wall hanging - great idea to highlight that, Laura! Thank you for hosting TGIFF this week - it looks perfect. :) The cross hatch quilting looks great on the finish, but I can only imagine how much work it was to do it. Thanks for hosting a link party! The crosshatch on your baby quilt looks perfect, but I can imagine it took forever. But it's so adorable! These are really cute finishes - The embellishments may have taken extra time but between those and the cross hatch quilting, this quilt looks wonderful! Cute rows! Thanks for hosting this week! They are adorable! Thank you for hosting this week! I love crosshatch quilting but boy does it take a long time! Worth it though, as it always looks stunning. Great job on your projects - both of them are so adorable!